Are you wondering when you should take your child to an eye doctor for their first visit? It’s recommended your child receive their first eye check up at six months, again at three years, and before starting kindergarten. Some pediatricians perform very thorough eye exams during normal check-ups, so you might choose not to take your child to an eye doctor until they’re older than five or are referred to a vision specialist by their pediatrician. 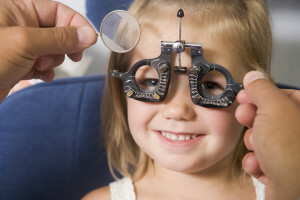 However, you might also have an eye doctor perform those first three eye exams (6 months, 3 years, pre-kindergarten). Choosing an eye doctor for yourself can be tricky especially with so many different types of eye care providers and specialty areas, and it’s even more difficult when looking for a doctor for your child. If you find yourself confused distinguishing the difference between all these doctors and practices that start with opt-, ophth-, and opti-, you’re not alone! Don’t worry, below we’ve provided an explanation of three main types of eye care providers and the differences between them. Ophthalmologist: An ophthalmologist is a doctor of medicine who specializes in eye care. An ophthalmologist attended undergraduate college, medical school, and completed a residency specializing in eyes. Ophthalmologists can sub-specialize in areas like retina, glaucoma, and pediatrics as well. Ophthalmologists can give routine eye exams, prescribe contacts and glasses, diagnose and treat eye diseases, and perform eye surgery. Think of an ophthalmologist as doctor who can treat eye health issues that may connect to issues in other systems of your body, or if you have a larger health concern that also affects vision. For example, if you had diabetes and it affected your vision, a traumatic eye injury, an infection, or any eye problem with the potential to be surgical, you’d need to see an ophthalmologist specifically. Optometrist: An optometrist attended undergraduate college, and optometry school. Optometrists can also specialize in specific areas of optometry such as developmental, pediatric, or behavioral optometry. An optometrist can perform routine eye exams, prescribe glasses and contacts, and diagnose and treat some eye diseases. For example, you might visit an optometrist for pink eye, dry eyes, and other common eye issues that do not necessarily connect to health concerns in other parts of the body. Developmental Optometrist– A developmental optometrist is an optometrist who specializes in the impact vision has on development. A developmental optometrist can give routine eye exams, prescribe glasses and contacts, diagnose and treat some diseases, and if applicable offer vision therapy. A developmental optometrist might treat an eye issue such as convergence insufficiency, difficulty getting eyes to work together to focus on close objects, with vision therapy and eye exercises. People are sometimes referred to developmental optometrists by their therapist, reading specialist, or other eye doctor. Optician: Opticians are technicians trained to fit glasses and contacts. Want more information on meeting milestones? Incorporate these daily activities into baby’s routine to help them meet milestones.